Da Na-Na-Na, Na Na-Na-Na-Na-Na BONANZA! The place where I found it is my favorite thrift store far and wide for a reason – they don’t rake you over the coals, price-wise. They don’t Goodwill you, if you know what I mean, and brother, if you read this blog with any regularity, you know what I mean! This booklet cost me a measly quarter. As well it should! I didn’t buy it with any thought of putting it on eBay and retiring to the gated Simi Valley community of “Parklane” with the profits. (If only, right?!) No, I just wanted a little something to read while I ate my #1 at Wienerschnitzel (two chili dogs, fries, and a bottomless Pepsi – foods I can feel good about eating). 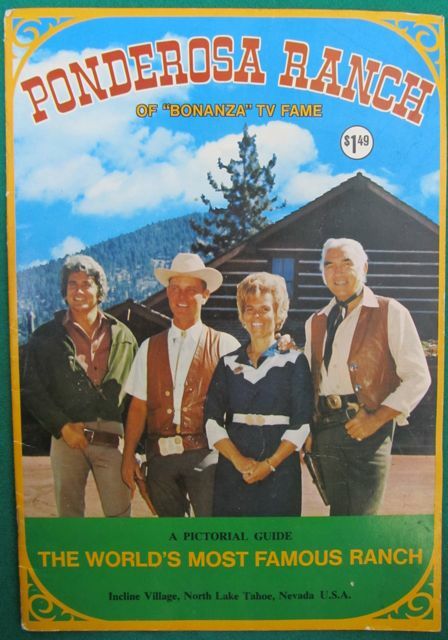 Anyway, like you, I’m too young to have watched “Bonanza” in its original run, probably!, but I’ve caught a few snippets of it on TV Land amounting to the time it takes me to find the remote and change the channel to find something, anything!, else. Because, folks, while enjoying a leisurely lunch there, cramming a couple of chili dogs into my face, I finally found proof to the contrary. Oh, I always knew – but to be able to prove it?! More delicious than the chili cheese fries I treated myself to for dessert. Finally, I had the ammunition to blow this whole “RARE vintage 1960s Bonanza tin cup” racket wide open! 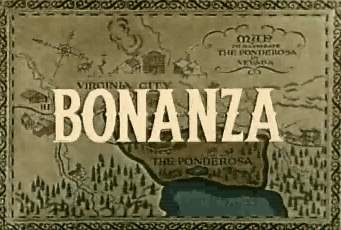 “Bonanza” debuted in 1959 on NBC. It ran for 14 seasons, for a total of 430 episodes. That means today you could watch one episode a day for three weeks before choosing to end your life rather than endure another 409 days of this torture. 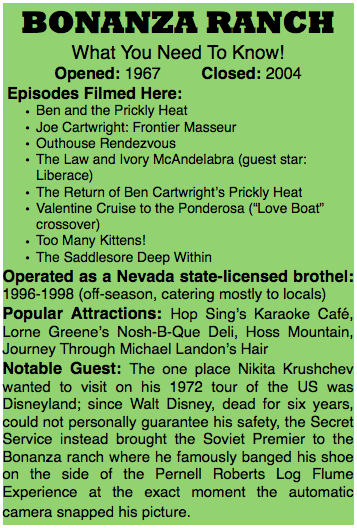 The show somehow takes place in 19th century Nevada yet near 1800s Lake Tahoe. Around 1965, Bill and Joyce Anderson, who owned a small ranch near where the fictional Ponderosa would have existed, struck a deal with NBC. 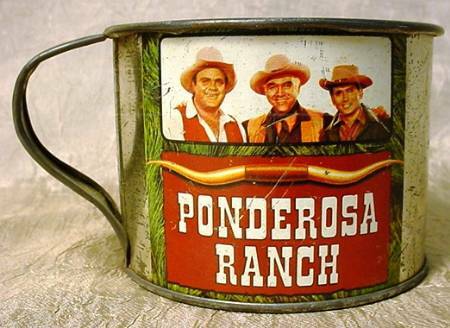 The result, the “Ponderosa Ranch” – a “Bonanza” theme park – opened in 1967. Occasionally, the “Bonanza” people would shoot scenes and sometimes entire episodes up there! Oh boy! Here’s what’s amazing: It only closed in 2004! Who in hell was visiting this place after about 1975? I mean, like you, I’m entirely charmed that it outlived the show by thirty-one years. I just can’t for the life of me figure out how. 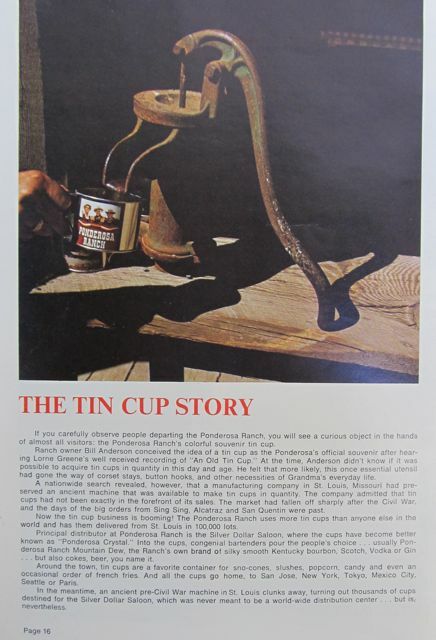 …that he found a company in St. Louis that could make new tin cups, and ordered them up in enormous lots to be sold as souvenirs. These were available throughout the park’s entire thirty-seven year existence. We all clear on this now, gang? They’re about as rare as the hairs on my Slovak grandmother’s back. They’re about as rare as flies on a Chickahominy prostitute. So I have no alternative but to advise every one of you to print out this entire post and carry it with you each weekend as you go antiquing, which I presume you do each weekend. Or better yet: Instead, why not carry with you the official souvenir guide itself which has the proof right there on the last page? Hey, I’m finished reading it. What the hell do I need it for anymore? First one of you who gets sixty bucks to me, it’s yours. Posted by Ted on June 13, 2012, 6:24 AM.